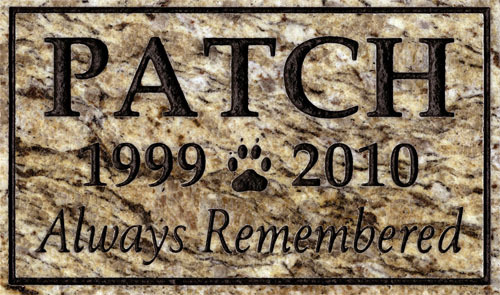 Granite Pet Memorials are made of the finest quality Granite. With a highly polished face and smooth cut sides these blocks make an excellent long lasting memorial. Memorials are available with up to 3 lines of text. If you desire a pet silhouette it can be substituted for one lines of text. Dimensions: 10" wide x 6" tall x 1 1/4" deep. Pet Memorials are a made-to-order product; please allow three days for preparation plus shipping time for your pet memorial. Custom graphics are available at additional cost, please call for additional information. Silhouetted images are the easiest for us to sandblast. NOTE: Because Granite is a natural stone, there will be color variation from one memorial to the next. Since each stone is unique your stone will be one of a kind. Please scroll down and fill in Lines 1, 2, and 3 first and then select the rest of your options. Enter Pet's Name, or other text up to 19 char. Enter Years as you want them to appear, or other text up to 19 char. Then choose a years separator above. Enter Epitaph, or other text up to 19 char.